Looking for the perfect customised Christmas present? Hand painted wine glasses have created a frenzy in the shops and command a price tag of £30 each! Join us in this new craze and create your own personalised, unique set of glasses at this exclusive Tastour event. It’s easy and incredibly therapeutic! Your host will introduce simple painting techniques then during your 2 hour painting session, you'll enjoy a guided wine tasting of 4 fine artisan wines. While your completed masterpieces are drying, you will have the opportunity to socialise with like-minded people with sharing platters of freshly prepared food. Non Members only £60, if booked one week in advance. £65 after. Tickets are strictly limited to 18 people for this intimate gathering. We will be have a meet and greet from 6pm and the presentation will start at 6:45pm. Location is 2 minutes from Monument tube, in the cellar bar of the Walrus and Carpenter. Note on creativity/artistic ability: No art skills are required... 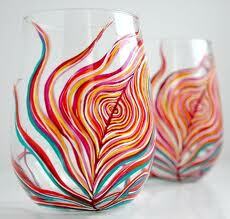 Even the shakiest hands can produce beautiful hand painted glasses. Note on food: Please state if you have any diet restrictions when booking and your request will be accommodated. The food will be served at 8:30. Note on end time of the event: The event time officially ends at 10pm, however the amount of time you will need will depend on how quickly you start your design and how much paint is on your glass. Some people may be finished by 9 whereas others may choose to continue to have a drink in the bar after the event whilst the paint dries. If you need to leave early, please let your host know and they will guide you on the thickness of the paint.